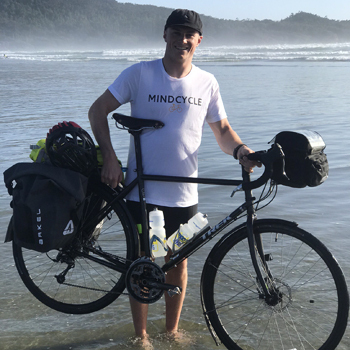 This past summer, Wilfrid Laurier University grad Ryan Martin (BBA ’16), bicycled more than 10,000 kilometres from one coast of Canada to the other to raise awareness for mental illness. He stopped in every major city in his path to speak to audiences and met hundreds more Canadians at gas stations and coffee shops along the way. The four-month-long trip was physically demanding, of course, but more than that it was mentally challenging. Martin, who has bipolar disorder, learned a lot on the ride about his mental health and how to manage it under extreme pressure. And by sharing his story, he encouraged Canadians across the country to talk more openly about mental illness. Through his ride, he raised more than $120,000 for the Canadian Mental Health Association (CMHA). Now the national lead of youth advocacy and philanthropy with the CMHA, he regularly speaks publicly about his illness and helps youth who struggled as he did. Martin is not cured — he still has challenging days — but he has learned how to better manage his mental health. The key has been finding strategies that work, such as meditating, calling a friend, exercising, seeing a therapist or watching a funny TV show, and then proactively using them when he needs to. It’s about recognizing when his thoughts are becoming negative or anxious and then working to not let those thoughts consume him. When he was in high school, Martin was often anxious and occasionally had low moods, but it wasn’t until he started university that his mental health issues began to have a greater effect on his life. Even though he felt things were going smoothly at university, he would suffer from episodes of debilitating depression followed by anxiety. After a particularly difficult summer, Martin met with a social worker and told her everything he was feeling. When he left, he felt euphoric. His anxiety was gone and he felt confident, but it didn’t last. In early 2017, Martin was diagnosed with bipolar disorder, type two, characterized with depressive episodes followed by an elevated mood that is less intense than full-blown mania (type one). Some of the difficulties he had been experiencing started to make more sense and he was able to start down a road to find medications that worked best for him. By the time Martin started on his ride from Tofino, B.C. to St. John’s, Nfld. 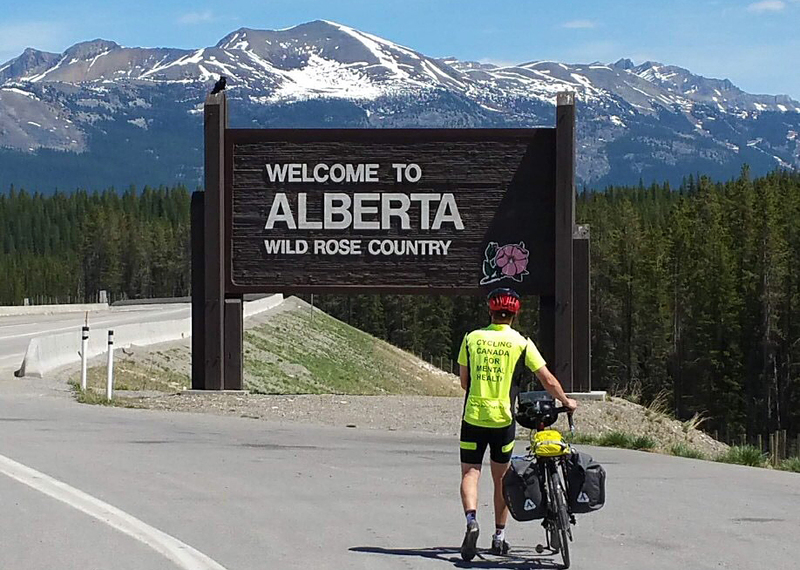 this summer, he had already shared his mental illness with most friends and family, but the ride gave him an opportunity to share his story even more widely and to get Canadians across the country talking about it. He saw friends and family opening up about their own difficulties and those close to them beginning to take those issues more seriously. Sharing his story over and over again has been therapeutic for Martin, but it has also changed his career path, too. Partway through Martin’s ride, he spoke at an event in Toronto and was approached by the CEO of the CMHA. A few weeks later, he was offered his current position as national lead of youth advocacy and philanthropy. The past few months have been busy and challenging for him; he moved to Toronto and is now spearheading a project for the CMHA using the $120,000 he raised, but he’s passionate about helping youth learn to better manage their mental illnesses, just as he has. “The only reason this all happened was because I started to open up about my mental health,” he says. “It’s amazing what can change in your life when you start really being accepting and open about your mental health. It’s the best thing you can do for yourself." About 70 per cent of mental health challenges have their onset in childhood or youth. For university students, the abrupt transition from living at home to supporting oneself at university can be a life change so big that it is likened to birth, death and marriage. There are many options available at Laurier to help students who are struggling with their mental health. The Wellness Centre runs Ride the Wave, a series of workshops designed to help students increase resilience, manage stress and develop coping strategies. These hour-long sessions are delivered throughout the academic year by professional counsellors. The centre, along with other campus partners, also runs Thrive Week, with free events focusing on building positive mental health and resilience, and Mood Walks, a weekly walking group designed to boost physical and mental wellness, among other events. The centre also offers short-term counselling from a team of psychotherapists and a mental health nurse and appointments with physicians and massage therapists as well as other allied health professionals. Delton Glebe Counselling Centre, affiliated with Martin Luther University College, offers a variety of therapeutic approaches, both short and long term, and has a team of psychotherapists, social workers, art therapists and a psychologist. The centre also offers Chilling with Dogs, an opportunity for students — and anyone else — to spend time with a few friendly dogs over the lunch hour. Pamela Loughton, an associate therapist with Delton Glebe Counselling Centre, said many students react to the pressure to excel in classes by skipping meals, sleep and not spending time with friends and family. Other offices at Laurier, including the Accessible Learning Centre, student advising and the Graduate Students’ Association offer support and services for students struggling with their mental health. Student-led clubs, such as Bridging the Gap, and centres, such as the Rainbow Centre and the Centre for Women and Trans People, are also available to provide support. Finding tools and strategies that work are key, whether it’s therapy, hanging out with dogs, making crafts, meditating or going for a walk, says Loughton. Most important, however, is finding a community. Ride the Wave: Hour-long skill-building workshops on the Waterloo campus to boost resilience and manage stress. Thrive Week: A week-long series of free events for students focusing on positive mental health and resilience. Offered in both fall and winter terms. Mood Walks: A weekly walking group in Waterloo hosted by the Wellness Centre to boost physical and mental wellness. The centre also offers short-term, goal-directed counselling, crisis intervention and crisis management with no waiting list, and other mental health resources. Appointments are available with counsellors, physicians and a mental health nurse, among other specialists. The Delton Glebe Counselling Centre offers both short- and long-term counselling and has a team of psychotherapists, social workers, art therapists and a psychologist. There is no waiting list and there is a reduced rate for students without insurance coverage. Chilling with Dogs is offered regularly through the centre as well. Visit the Delton Glebe Facebook page for upcoming dates. Good2Talk is a free, confidential helpline providing professional counselling and information and referrals for mental health, addictions and well-being to postsecondary students in Ontario, 24/7/365. Call 1.866.925.5454. Go to the emergency department at the nearest hospital.